Explore the outer reaches of known space, away from the Commonality's grasp. Publisher's blurb: "Fire your planing engines beyond the Rim, above the galactic plane to the outer worlds, free from Commonality assimilation. There's a bounty out here on Event Horizon Probes, and the only synthetics are those who serve us. "My family is from the revered Wayfarers' Guild, with Voyager eugenics strong in our lineage. I do not hold to the Utopian rapture, for I have flown a Stargull across the Dragonfly Ruins on Balar, and believe that all our fates are to be found there. "Join us! Think free! Live true! We are the Far Havens. We stand together; we go beyond. 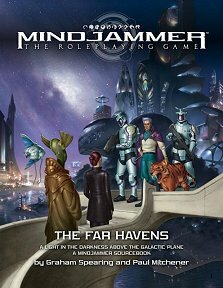 "The Far Havens is a campaign pack supplement for your Mindjammer game, providing rich setting detail for an exotic polity far beyond the Commonality frontier, above the galactic plane, which fiercely resists the inexorable advance of the event horizon probes. Join the Licensed Free Agents and the New Traders: explore this perilous frontier, and fight the machinations of the Commodus sentience and the rise of ancient powers..."